The Velaqua is a water purifier, an alkalizer, an energizer. It operates gravity feed (no electricity needed). 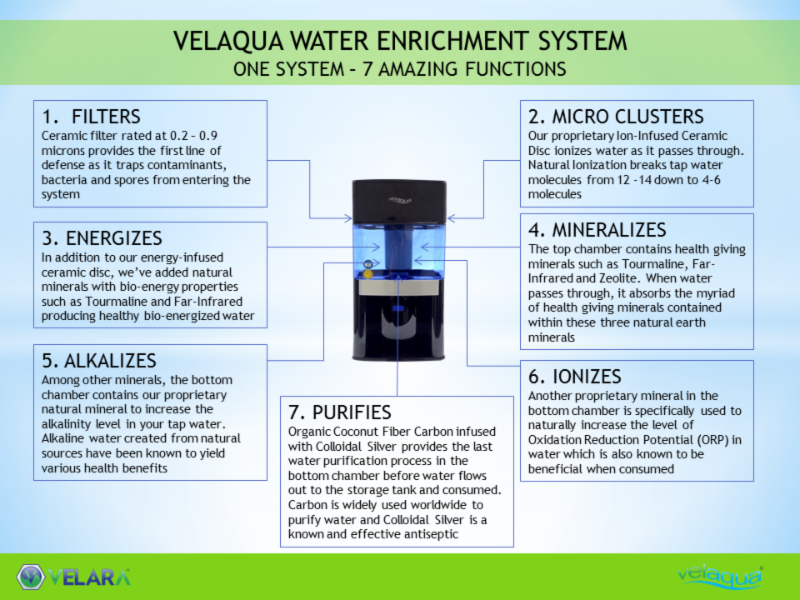 Velaqua~~Patented, NON-Electric, Gravity fed Water System that is the ONLY one in the World to: Purify, Alkalize, Ionize, Mineralize and Micro-Cluster Water using the same process as Nature, by gravity through rocks and rare earth minerals! There is nothing like this anywhere on the market.... it's priceless..and tastes like no other....tastes great. TO A NEW HEALTHY YOU! Below is an extremely interesting article I found about Dr. Otto Heinrich Warburg, 1931 Nobel Prize Winner, about “The Root Cause of Cancer”: Dr. Otto Warburg discovered the root cause of cancer in 1923 and he received the Nobel Prize for doing so in 1931. Dr. Warburg was director of the Kaiser Wilhelm Institute (now Max Planck Institute) for cell physiology at Berlin. He investigated the metabolism of tumors and the respiration of cells, particularly cancer cells. Below in the doc file are some direct quotes by Dr. Warburg during medical lectures where he was the keynote speaker. Other Articles of Interest are below.